Looking to escape to the mountains for a refreshing retreat? Pack your hiking boots and head to this rustic cabin-style home in Bayfield, Colorado, 'where the stars shine bright.' Nestled at the end of a wooded road in this little town sits this 3-bedroom, 2-bath vacation rental home for 8 on the shores of Vallecito Creek. Boasting a ping pong table, gas fireplace, and furnished backyard, this 1,388-square-foot home has everything you'll need to create unforgettable memories with your family. After a long day of exploring Durango, gather in the home's expansive backyard and unwind to the lullaby of the creek. With a large seating area, charcoal grill, and 360-degree natural views, this creek-bordered yard will transport you back to simpler times. 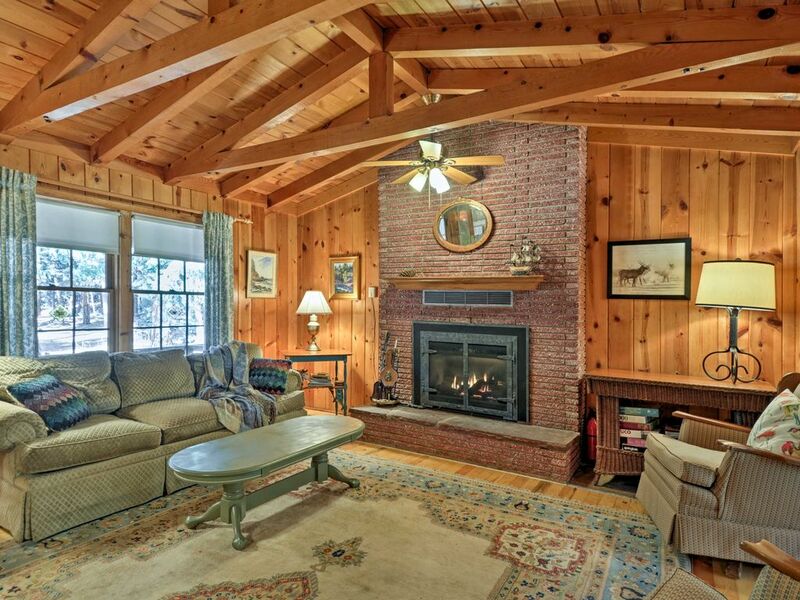 When the brisk night air begins to chill your bones, seek refuge from the cold under the home's exposed wood ceilings. As you sit on the living room couch and feel the heat of the gas fireplace hit your face, enjoy your favorite book or lively conversation with friends and family. The well-equipped kitchen, featuring an oven, breakfast table for 2, and more, has everything you'll need to whip up a 5-star meal for your loved ones. After dinner, challenge loved ones to a game of ping pong in the garage before winding down fireside with a nightcap. As the kids drift off to sleep in their twin-over-full bunk bed, head to the master bedroom to rest your head on the cozy queen-sized bed. Channel your inner Lewis and Clark and explore the majestic wilderness of southern Colorado by hiking the Vallecito Creek Trail. Sitting just minutes from the property, this moderately difficult, 11.8-mile hiking trail, allows hikers to marvel at the creek and wildlife while climbing 1512-feet in elevation. When the hot Centennial sun's beating down, head 10 minutes down the road and dive into the Vallecito Lake. This breathtaking lake, surrounded by the San Juan National Forest, is not only home to some of the state's best fishing, but also boat rentals, cross-country skiing, and camping! Don't miss a chance to explore the unique town of Durango, located less than 30 miles from the property. Whether you spend your day eating green chili stew at Gazpachos New Mexican Cooking y Cantina or exploring the shops that give visitors a taste of the one-of-a-kind culture of the area, you're sure to fall in love with this southwestern city. Want to take a first-hand look at this region's unique history? Drive 85-miles west and see how the ancient Puebloans lived at Mesa Verde National Park. Home to Cliff Palace, the largest cliff dwelling in North America, this park will truly provide you with an unforgettable experience. Quiet, secluded, great house with all the comforts of home! House was stocked beyond expectations & was immaculately clean. We will definitely keep this one on our list again for future stays! This is a spacious cabin on a beautiful creek set in Ponderosa pines. If you like Hiking or sitting back and listening to the flow of the creek then this is cabin for you. Owners are accommodating and communicate well. Loved this Cabin bought back lots of memories of when times where simple with out phones or lots of traffic loved the record player with a amazing collection of vinyl records. Cabin is close to trails, river and the front porch swing is the perfect place to drink your coffee and just sit and relax. Was out and about during most of our stay. However spent one day just relaxing at the cabin. Plenty of games there to play. Weather a big relief from the heat of Kansas. Had an issue with a light switch not wanting to work and was taken care of quickly. Very nice property owners and friendly. When in the area again will be looking to stay again. We just loved this cabin! It was perfect for our little honeymoon. We walked the near by trail, spend time out by the river behind the cabin, and spent some time sitting on the front porch swing. It was amazing spending all that time out and just enjoying nature. All the sights were just so beautiful! I was in awe the whole time. We had a blast playing ping pong and all the board games that were there. It was so much more than I could have imagined! The cabin was such a dream come true. It was perfect for us and we plan to come back! The owners were also amazing to deal with. They were great at letting us know how to get in the cabin and where near by shopping was the best! Thank y'all so much!! !